“I represent only President Trump not the Trump campaign. There was no collusion by President Trump in any way, shape or form. 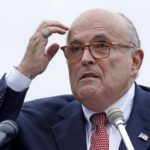 Likewise, I have no knowledge of any collusion by any of the thousands of people who worked on the campaign,” Giuliani said Thursday. It was not clear whether Giuliani, in the television interview, was reflecting a new position or talking point from the Trump legal team or was making a strategic attempt to get ahead of potentially damaging findings from special counsel Robert Mueller. Mueller has been investigating potential coordination between Russia and the president’s campaign. Trump has repeatedly insisted there was no collusion during his successful White House run. “I never said there was no collusion between the campaign or between people in the campaign,” Giuliani told CNN.